Why did Matthew Dowd call Governor Scott Walker “Fred Flintstone”? 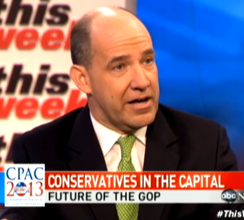 Matthew Dowd said on ABC’s This Week that attendees at the 2013 CPAC conference last week in Washington were “like a bunch of dinosaurs.” CPAC reminds him of “you know, ‘Land Before Time’ and (is)…. like going to a Flintstones episode.” He sounded more like a mindless Tina Fey wannabe than a thoughtful Republican by saving a special jab for Governor Sarah Palin, whom he compared with the Kardashians. While I proudly have never watched any reality television show, I am pretty sure that the wholesome-family-life-in-Alaska Palin reality show was not in the same universe with whatever shallow drivel constituted entertainment on the Kardashians’ messy-life-on-display show. But this isn’t in particular to pick on the Kardashians or Dowd. His tone echoes the derision that too many politicos espouse against confident conservatives. (For those who have understandably forgotten, Dowd was the chief strategist for the 2004 George W. Bush campaign. Of course you don’t hear W speaking about Republican leaders in the way Dowd does.) Dowd epitomizes the want-to-be-liked-and-get-more-TV-appearances pseudo-Republican crowd that joins liberals in taunting conservatism. Dowd’s too-cool-to-be-conservative strategy apparently contemplates winning future elections by proudly standing for centrism, moderation and compromise. Kind of odd, but he and similar thinkers seem to be assuming that moderates and centrists can be counted on to bring the political fervor and activism needed to win elections, to rival the passion of the “hope and change” crowd. Hard to see the path to victory there. The 2013 CPAC included serious intellectuals presenting substantive policy proposals, ranging from analyzing our nation’s policies on war, when and where to fight, immigration policy initiatives and considerations, the role of small businesses in the ongoing economic situation, a federal balanced budget amendment, energy policy, the United Nations, and a whole host of other issues facing America. Governors Jeb Bush, Scott Walker and Bobby Jindal, as well as Senators Jim DeMint and Ted Cruz and more than 20 elected current and former Congressmen, Senators, and many other very popular elected officials and party leaders spoke. These are actual thought leaders, with real boots on the ground and real-time experience in the American political scene. But the most important fact that the “Dowders” miss is that conservatism is the only place in the Republican Party where passion resides among young voters. This is the first time I have attended CPAC, and the crowd was overwhelmingly young. Literally, half of the crowd appeared under 30. When is the last time you saw that demographic at a Republican rally? The reason is simple: conservatism gives young voters, and all voters, something to stand for, to stand with, to believe in. It offers a strong contrast to the Big Government growing Left. Conservatism tells young voters that there still is a party that supports liberty and limited government. A Party that recognizes the seriousness of our national fiscal condition, and is brave enough to do something about it. The last point to “Dowders”—the ranks of Democrat voters include tree-hugging anti-automobile, anti-industry environmentalists as well as pro-auto and pro-industry union-job supporting voters. There are other wildly opposed factions within the Democrat Party’s voter base. ABC and Martha Raddatz do not invite these clearly opposing factions of the Democrat Party on the show to bash each other. They only invite Republicans on air, to create and fuel division and derision. Raddatz and ABC play the “Dowders” of the political world for fools, luring them with the enticement of national television coverage if they will only join in the Fred Flintstone style bashing of conservative ideas, and conservative leaders. Let’s stop playing their game.